Developers of the Ritz-Carlton Residences, Miami Beach have closed on $95 million in construction financing, according to a mortgage recorded in Miami-Dade County on Thursday. Little Rock, Arkansas-based Bank of the Ozarks was the lender for the luxury residential development at 4701 North Meridian Avenue in Miami Beach. An affiliate of Miami-based Lionheart Capital, led by Ophir Sternberg, was the borrower. The financing brings the mortgage to $105 million. It was originally an $8 million loan, according to Miami-Dade County records. The development, on seven acres on the shores of Surprise Lake, is designed by Italian architect Piero Lissoni. When completed during the fourth quarter of 2016, it will have 111 condominium units and 15 single-family villas. 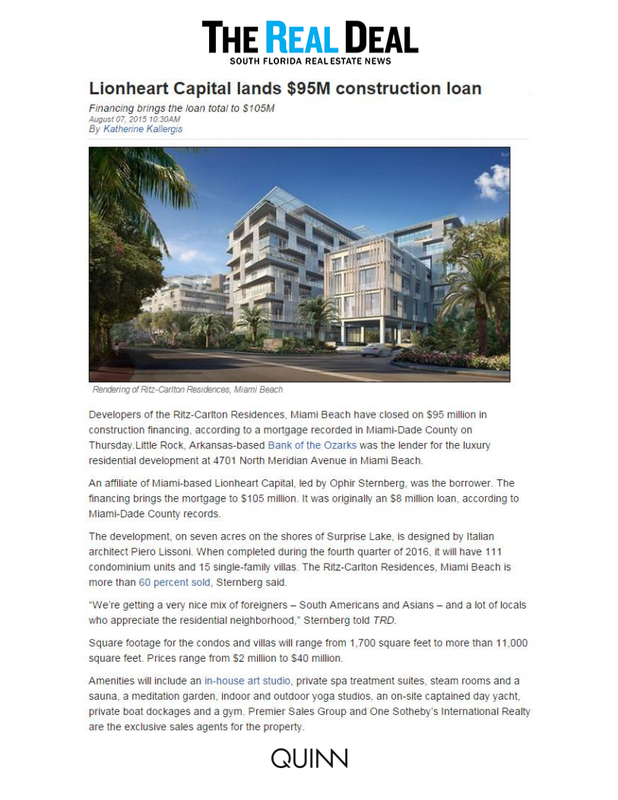 The Ritz-Carlton Residences, Miami Beach is more than 60 percent sold, Sternberg said. “We’re getting a very nice mix of foreigners – South Americans and Asians – and a lot of locals who appreciate the residential neighborhood,” Sternberg told TRD. Square footage for the condos and villas will range from 1,700 square feet to more than 11,000 square feet. Prices range from $2 million to $40 million. Amenities will include an in-house art studio, private spa treatment suites, steam rooms and a sauna, a meditation garden, indoor and outdoor yoga studios, an on-site captained day yacht, private boat dockages and a gym. Premier Sales Group and One Sotheby’s International Realty are the exclusive sales agents for the property.